At the close of the markets on October 4th, 2017, I joined the millionaires club on my last day before I would turn 38 (the exact time this article was published). I have spent the last 365 days, or all of my age of 38, as a millionaire. I’ve been doing a lot of reflecting the last few weeks, thinking back on the last year and how my life has changed. Maybe this is just one of those episodes of me starting to feel old as the gray hair starts to show a little more and my 39th birthday approaches, but I’ve been thinking about how life has and at the same time hasn’t been the same for better or worse. Many people say that a million dollars isn’t much money, and I’d have to say I agree. However, at the same time, if a million isn’t much money, why does hitting that financial milestone elude the great majority of people. So it stills holds a certain place in people’s mind to hit as a milestone. Over the last year, I can honestly say it hasn’t changed my life at all. One reader commented best that it’s like any other day, except it’s not. That’s pretty much how I feel about the milestone. I left work that day to pick up some groceries and went home, going to work the next day, waiting for the weekend to go out. It simply wasn’t as big a deal as I thought it might be (spoiler). After all, I knew for a long time that it wasn’t a matter of “if” but “when” I would become a millionaire. Now I’d be lying if I said having these financial assets didn’t matter to me. If anything, knowing that I have enough financially to support my modest lifestyle does do one thing in that I don’t have to actually worry about money. If a situation pops up, no problem, I have it covered. But there has to be something more that money brings to your life, right? One thing I’ve definitely realized about having some money is that there should be a point to it. Having gone back to work, I miss having my free time to do what I want, when I want. This is just temporary, in that I will be leaving the work force again (hopefully for good this time) and have my freedom back. So while working, the money has accumulated even more to the tune of about $170,000+ extra. Has that increased my satisfaction or happiness level in life. No, not really. It hasn’t detracted, but the marginal benefit of each accruing dollar diminishes. I more so think of money as this digital character that appears on a computer screen, flashing before my eye. I’m still the same boots and blue jeans wearing guy, who drives a 15 year old car. So none of that lifestyle has changed. Financially, I am very well off and this will only continue to increase over time. The realization that I’ve come to, is that having money is nice, but it’s not the only thing. I miss more than anything having someone to spend my time and money with. A year ago, I was seeing someone that I could actually see myself settling down with. It was a great feeling. It was a rare time in my life where my mind wasn’t thinking about numbers all the time, but simply what plans would be fun for date night, creating fun memories. Not memories of which stock I bought at which entry point and projecting a return and cash flows that would be coming off of that investment. Money by itself, for yourself, is quite simply boring. Not even a tangible item anymore, but a series of code in a program for a brokerage account, sitting in the ether of the internet. I’ve tried to replace that part of my life, but with no success as that special chemistry just doesn’t seem to be there. My recommendation for anyone looking to hit their financial independence or really any goal in life…find that special someone who has the same goals as you. It’s not only easier when 2 people are tackling the goal, but better to have that partner along for the journey. 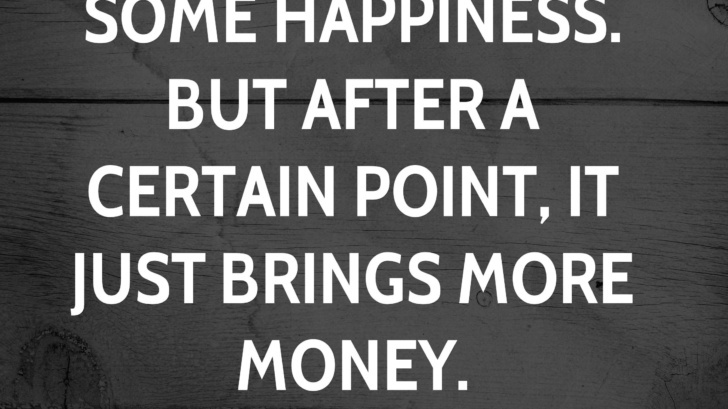 So despite what movies and media say, there are two things money doesn’t buy… time and happiness.